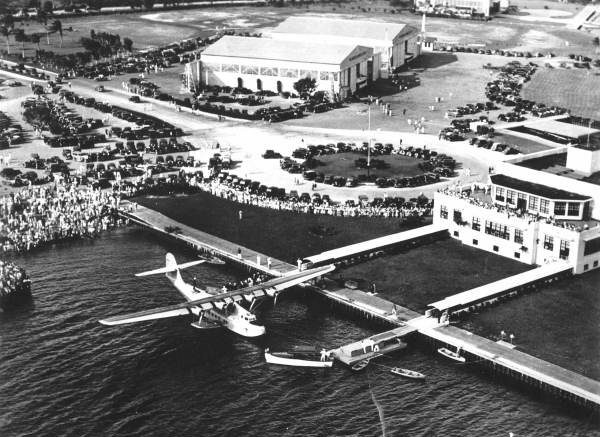 The seventh episode of the Miami History Channel features the decade of the 1930s. The decade of the Great Depression brought both despair and opportunity. Florida began to ease out of economic malaise earlier than other parts of the country. Tourism and the growth of aviation were two big drivers for the improving economy in South Florida during this decade. The Miami area was a favorite destination of America’s most infamous gang leader in the late 1920s and early 1930s. Al Capone set his sights on South Florida as his second home. He bought a mansion on Palm Island and tried to blend into the community. The community leaders fought to rid the area of Capone and his gang. Bayfront Park was the site of a near change of destiny for the country in February of 1933. While Franklin D. Roosevelt spoke in front of a large crowd on a February evening in the park, an anarchist fired several shots with the intent to kill the president-elect. Fortunately, the FDR was not hit. However, the attempted assassination did wound several bystanders including the mayor of Chicago. The mayor’s wounds would prove to be fatal. South Florida was also a big beneficiary of the New Deal programs put in place by President Roosevelt. Many of the projects initiated by the alphabet agencies benefited the Miami area for many decades. The Orange Bowl was one example of the many projects that were under the sponsorship of Roosevelt’s New Deal. The great 1935 Hurricane hit the Florida Keys, but impacted the entire South Florida area. Many of the lives lost during the hurricane were WWI veterans working on the Oversea Highway. A train sent from Miami to rescue the men arrived as the storm hit. The 1935 Hurricane was one of the strongest storms ever to make landfall in the United States. The 1930s was the decade that brought the Art Deco architectural design to Miami Beach. Investments by the benefactor Henry Doherty helped keep Miami and Coral Gables afloat during tough times. Lastly, the continued growth of transportation, and expansion of infrastructure to support the growth, were very important during the last years of the 1930s. While it was a decade to forget for most of America, the end of the decade provided a lot of hope for the future of South Florida.